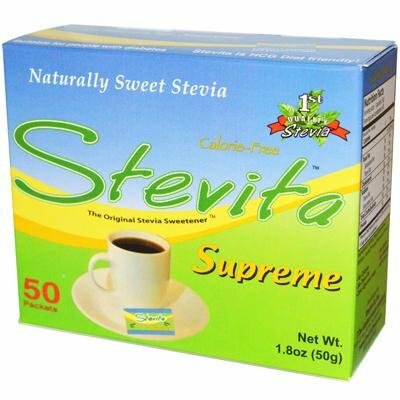 The purest Stevita Stevia (98% Reb A minimum purity) is blended with xylitol, a flowing agent extracted mainly from the bark of the birch tree, which has many superior medicinal properties such as such as preventing cavaties, preventing ear infections, preventing bad breath, and improves bone density. Safe for diabetics. SUGAR-FREE SWEETENER - Our velvety-Smooth Blend of Organic Stevia and Xylitol is meticulously crafted to taste like sugar with no bitter aftertaste. Our 0 calorie sugar substitute is 4 times as sweet as sugar, meaning you use much less, making it an exceptional value. ALL NATURAL - Our blend contains no artificial sweeteners. Our Stevia is 100% Certified USDA Organic, Fair Trade, and Non GMO. It is also Gluten-Free and Kosher Certified and is safe for Diabetics, Vegans and those following Paleo or Keto Diets. Our Stevia is also Tooth Safe. SUSTAINABLY SOURCED - All our stevia comes from the plant's natural habitat in southwestern Brazil. Our products contain no artificial fillers. PACKAGED FOR FRESHNESS - Our Stevita Supreme comes wrapped in individual packets so you can take them with you. They allow you to only open as much as you need when and where you need it. If you have any questions about this product by STEVITA, contact us by completing and submitting the form below. If you are looking for a specif part number, please include it with your message.